Flag of the Municipality of Girardot, State of Aragua - Summoned to competition for the design of the municipal flag, organized by the Mayor's Office of the Municipality Girardot, the people of Aragua responded with numerous proposals. The examining jury choose Mr. Francisco Mart�nez Chac�n's design. 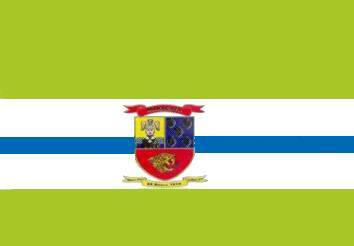 The flag of Girardot is composed by five strips diverse size and color: those of green color symbolize the hope, the perseverance, the intrepidity and the friendship as the inhabitants' of the municipality virtues, as well as the greenery of the mountain to whose foot is the municipal territory. The white strips represent the faith, the purity and the integrity, virtues that reach eminent expression in the Mother Mar�a of San Jos�, native of Choron�, coastal town of the municipality, and beatified by the Pope Juan Pablo II at the City of the Vatican, May 7, 1995. The indigo blue strip, represents the justice, the pity and the loyalty, and also the marine, lacustrine and fluvial waters that bath the soil of the municipality. Toward the center, appears the coat of arms of the municipality. The flag was hoisted by first time on March 5, 2001, on ocassion of the tricentennial of the city of Maracay, capital of the municipality and of the state of Aragua. Coat of arms of the Municipality of Girardot, State of Aragua - It was adopted toward 1960, I don't have the precise date. 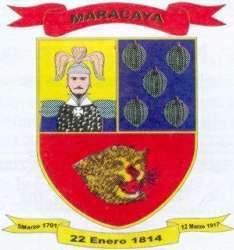 It is divided in three barracks: in the first one, gold, there is a figure of a non proven historically Indian chief called Maracaya, from where the name of the city of Maracay would come; the second, azure, contains five fruits of cocoa (Theobroma cocoa), pillar of the regional and Venezuelan economy until the end of the 19th. Century, and still of the best in the world; the third, red, contains the head of a jaguar (Panthera onca or Jaguarius onca), whereas according to another version the name of Maracay would come from the Caribbean (Indian) voice for that animal, maracaya. This same word, Maracaya, is in a tape at the top. Another tape, at the bottom, contains three historical dates: March 5, 1701, when the Bishop of Caracas, Diego de Ba�os y Sotomayor, rose San Jos� of Maracay as an ecclesiastical viceparish, to make offcial its existence; January 22, 1814, when the Liberator Sim�n Bol�var rose it to the range of city through an ordinance; and March 12, 1917, when the Legislative Assembly of the State designated it as the capital city of Aragua. The name of the Municipality, Girardot, is an homage to Colonel Atanasio Girardot, a Colombian officer in the Liberator's Army, who died in Venezuela, in the site of B�rbula, State of Carabobo, in 1813. There is a Girardot Square (plaza Girardot) in Maracay, with a monolite which regards the Americans that came with the General Francisco de Miranda expedition to liberate Venezuela, in 1806, and died as POW of the Spaniards. The image at the official site <www.alcaldiagirardot.gov.ve> got different shade of green. Recently we was on Maracay and we saw the Flags of Venezuela, Aragua State and Girardot Municipality hoisted on a square . The shade of green is the same of the image sended by Mr. Pablo Acosta R�os.